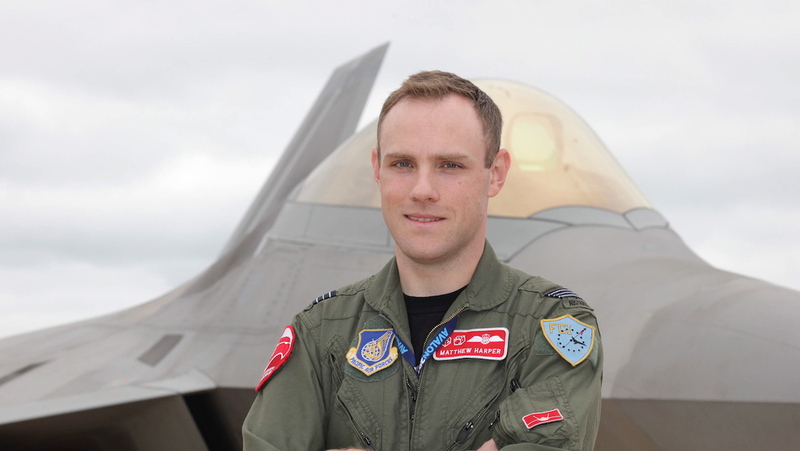 This interview with Royal Australian Air Force (RAAF) SQNLDR Matt Harper, Australia’s first F-22 Raptor pilot, by Michael Serenc at the 2011 Australian International Airshow at Avalon first appeared in the May 2011 edition of Australian Aviation. 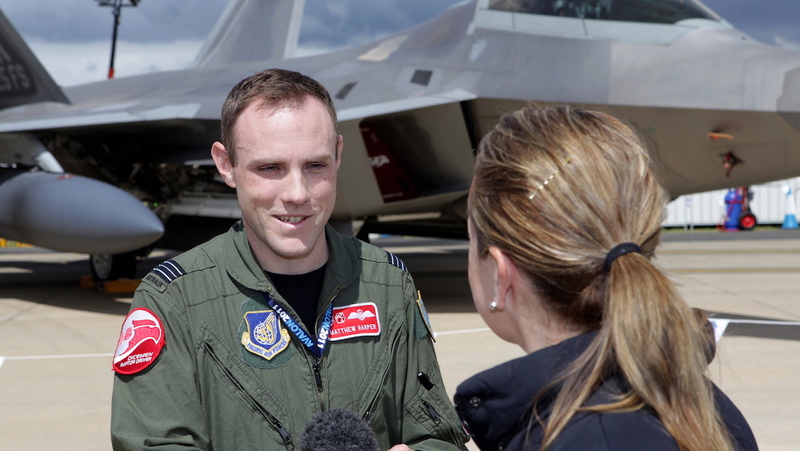 Among the hundreds of pilots who descended on Avalon for the Australian International Airshow, RAAF SQNLDR Matt Harper was unique among them in being Australia’s first F-22 Raptor pilot. Finishing up a three-year exchange with the US Air Force’s 90th Fighter Squadron, part of the 3rd Wing based at Elmendorf, Alaska, Harper, together with fellow Raptor pilot, CO of 3rd Wing sister unit the 525th Fighter Squadron, Lt Col Chris Niemi (below left), spoke to Australian Aviation about his experience flying the world’s only operational fifth generation fighter. What has the F-22 exchange experience been like? It’s been very, very positive. We’re lucky enough that the US government and the Australian government have been very, very close, and it’s important to both our militaries that we are very interoperable. As such, we have a lot of exchange programs back and forth between the US and Australia, it’s bilateral. 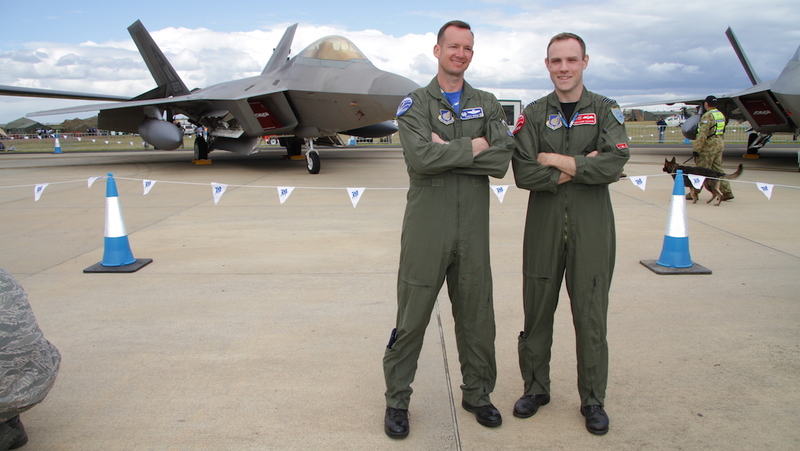 Knowing this and going across and flying the F-22, I was expecting that it was going to be a very positive experience. Hopefully I’ve been contributing just as much as all the other US weapons officers who have been able to convert across to the F-22, so it’s been very, very good. When you come back to Australia, what kinds of experiences or lessons can you bring back to prepare the RAAF for its next gen fighter capability? Certainly through teaching and flying the F-22, those lessons are going to be very, very useful for Australia as we transition to flying the JSF in a few years’ time. More importantly right now, our Air Force, because it’s so small, we spend a lot of time concentrating that we are 100 per cent interoperable with the US Air Force. Our squadrons see themselves as like almost a plug-and-play asset to combine with any coalition force that potentially we might need to operate with anywhere in the world. So the most immediate impact that I’ll be able to have is making sure that all of our tactics and capabilities that we have are very easily integrated into the US, as they transition from 4th gen capability in their Air Force to a predominantly 5th generation Air Force with its JSF and F-22, and then also with the JSF coming into the Australian Air Force. Lt Col Niemi, how has SQNLDR Harper integrated into the squadron and performed as an exchange pilot? I have had the opportunity of working not just with Matt, but with two other Australian exchange officers, and all of them have been top notch. It’s speaks volumes of the quality of the RAAF officers and fighter pilots. I’m sure they’re very carefully chosen, but to have another weapons officer trained individual [Harper is a RAAF FCI], particularly one with a unique perspective flying our airplane where they can take a look at what we’re doing, and kind of offer that unique perspective, some inputs that would not have otherwise occurred to us, is a real benefit. To be honest with you, it’s not really a big deal from our perspective in terms of he’s like any other major, second level supervision in a fighter squadron…It’s of benefit to us to have his expertise and we don’t treat him differently or expect anything different from him, and he’s certainly delivered so he’s been an outstanding officer. He’s made the 90th Fighter Squadron, which I used to be in incidentally… better through his presence over the last few years. So I think it’s a great deal for both our countries who have this [exchange program]. SQNLDR Harper, what is the F-22 like to fly? The F-22 is just a fantastic aircraft. It was really designed with a fighter pilot in mind – all the ergonomics in the cockpit are well thought out. I think a lot of the lessons that you would learn through the development of cockpits for the F-18, F-16, a lot of those lessons were acknowledged, and when the cockpit of the F-22 was developed, it’s a very, very easy aircraft to sit down in and find your way around and operate out there tactically. Flying-wise, it’s similar in many respects to a Hornet, it’s just got a lot more power. You still need to be a little bit careful with it, every now and then. For the most part, the aircraft is, with the flying control systems completely electronic, so very, very stable in all the flight regimes. It’s got a lot of excess thrust, so when you really need to go fast, it’ll get up and go … so that’s one of the great capabilities of the F-22. VIDEO: A United States Air Force F-22 Raptor rehearsing before the 2019 Avalon Airshow from the RAAF YouTube channel. This story first appeared in the May 2011 edition of Australian Aviation. To read more stories like this, become a member here.